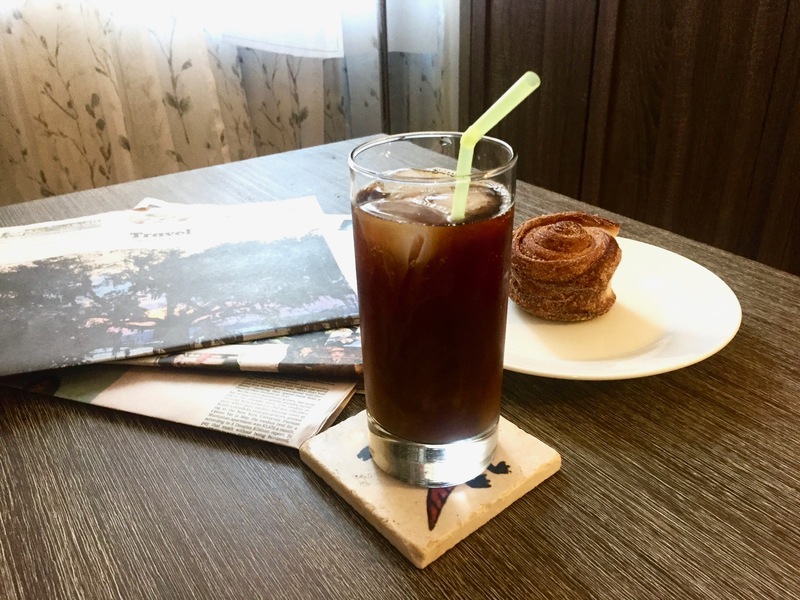 This summer refreshing drink is a stable of Cuba not only because it was firstly made there, but ingredient by ingredient the constituents of the drink are Cuban. Sugar, Rum, lime and mint… well maybe not the mint, but all the rest are. 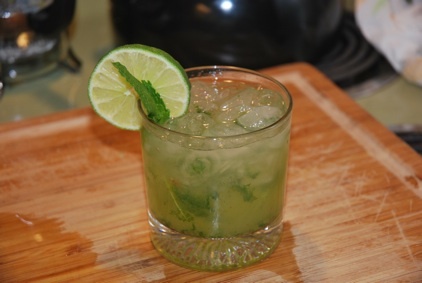 Many say that this is just the child of the marriage of the mint julep and the Hemingway favorite the Daiquiri.Cuba is the birthplace of the mojito, although the exact origin of this classic cocktail is the subject of debate. 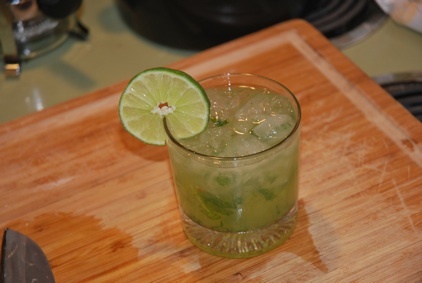 One story traces the mojito to a similar 16th century drink, the “El Draque,” in honor of Sir Francis Drake. It was made initially with tafia/aguardiente, a primitive predecessor of rum, but as soon as Spanish rum became widely available to the British (ca. 1650) they changed it to rum. 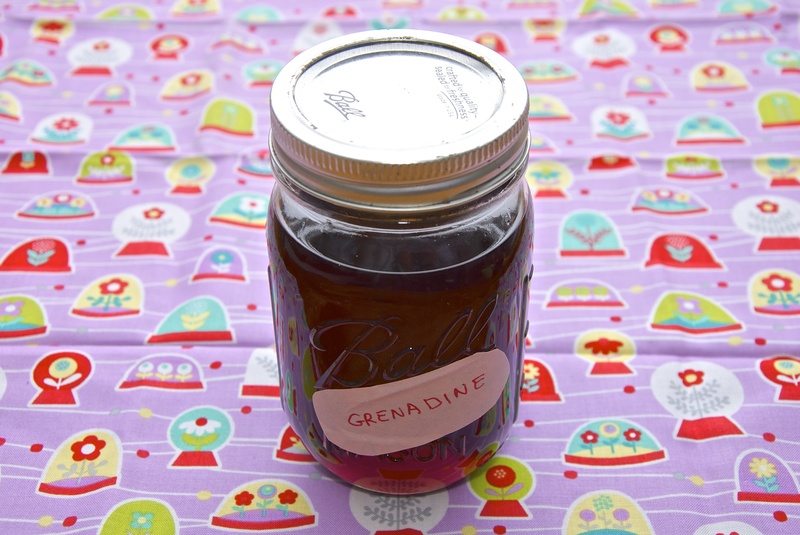 Mint, lime and sugar were also helpful in hiding the harsh taste of this spirit. 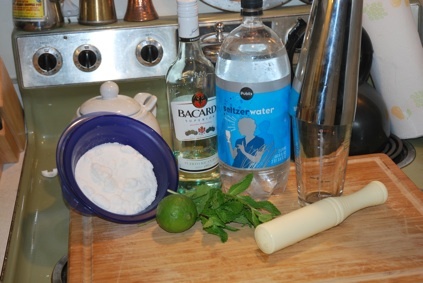 While this drink was not called a mojito at this time, it was still the original combination of these ingredients. Some historians contend that African slaves that worked in the Cuban sugar cane fields during the 19th century were instrumental in the cocktail’s origin. Guarapo, the sugar cane juice often used in mojitos, was a popular drink amongst the slaves who helped coin the name of the sweet nectar. 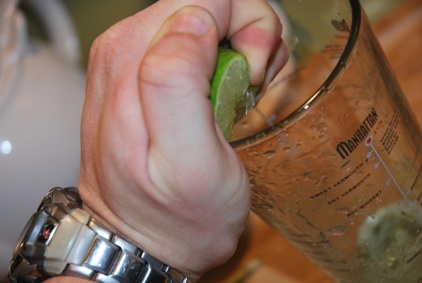 There are several theories behind the origin of the name mojito, one such theory holds that name relates to mojo, a Cuban seasoning made from lime and used to flavour dishes. 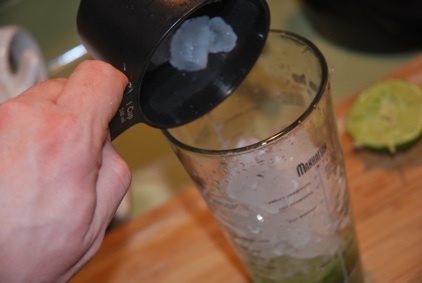 Another theory is that the name mojito is simply a derivative of mojadito, Spanish for “a little wet”, or simply the dimunitive of “mojado” (wet).Well enough with history that nobody reads. If you actually read it then tell me the hidden word (it is koumbaya) and I will make you a free mojito. So anyway here are the ingredients. 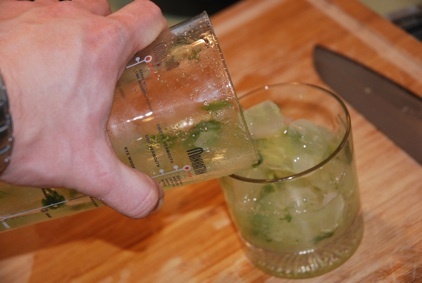 Typically for Mojito it is custom to use a nice thick brown sugar. But not all brown sugar is suitable. The right one is the raw sugar or even better the Demarrera sugar. The pure sugar cane that it is the first eatable sugar. Since Rum is made of the leftover molasses it is almost like rejoining two separated parts the sugar cane. I, however, prefer the regular white sugar, since the flavor is more clean and marries amazing with the crispness of Rum. 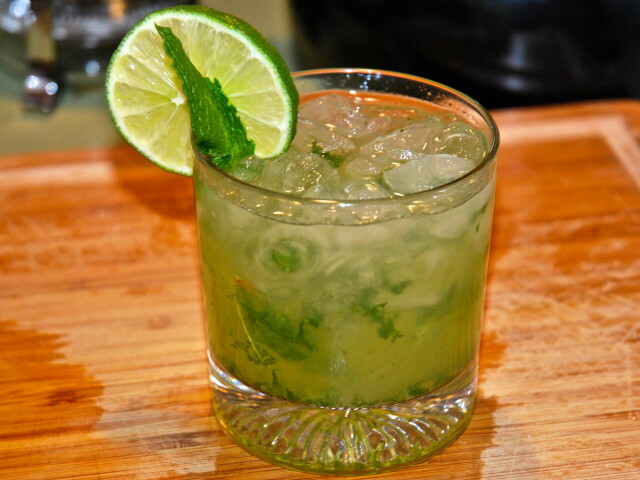 It is however a matter of taste; I do ocasionally enjoy a Demarrera sugar Mojito with a spike of dark Rum. You probably noticed the Boston shaker and the muddler. I use a plastic cheap muddler in contrast with the popular wooden. The wooden muddler can become a microbial nest. 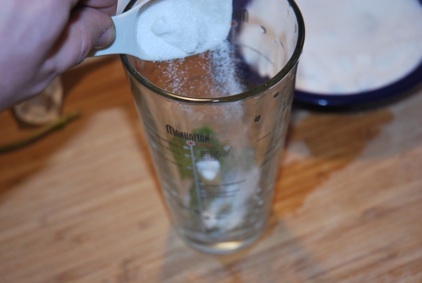 Start by adding a tablespoon of sugar in the bottom part of the Boston shaker. 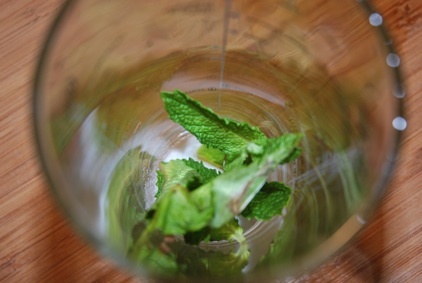 Take 6-7 leaves of mint, preferably very fresh, bright green leaves. And add them on top of the sugar. Follow that with one more tbsp of sugar. 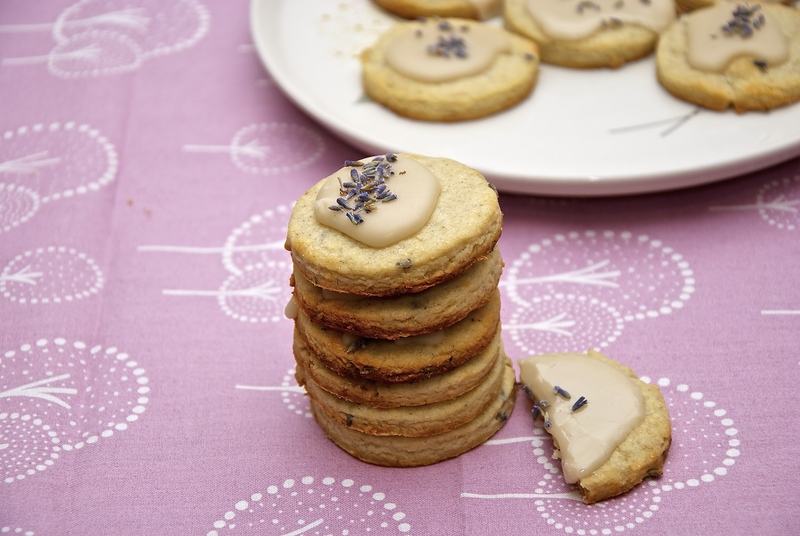 The sugar at the bottom and top acts as an abrasive and mash the leaves. A small note here. As you see I wrongfully use white sugar. Demerara sugar is much better tasting. I learned that much later than this post. 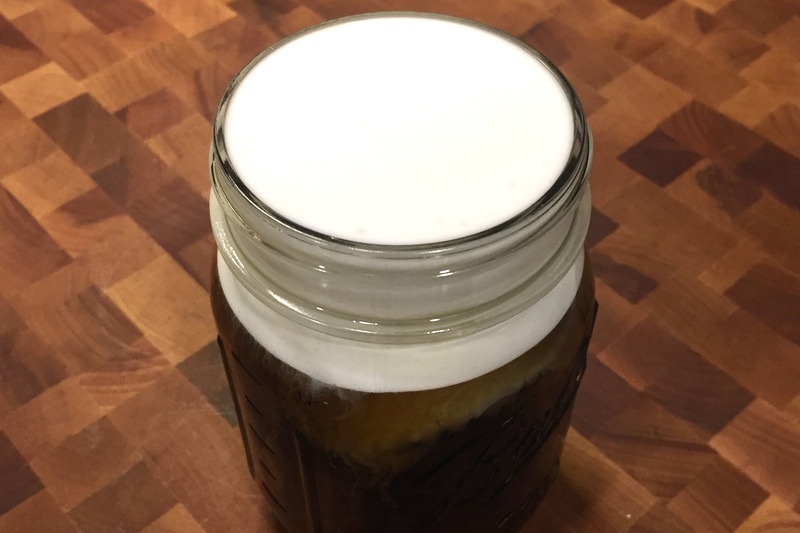 Mash as much as you wish with your muddler. 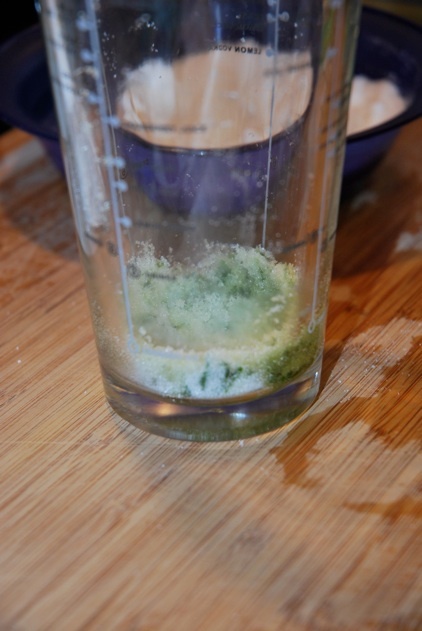 At the end you will be left with a green color sugar and a very refreshing aroma of mint. 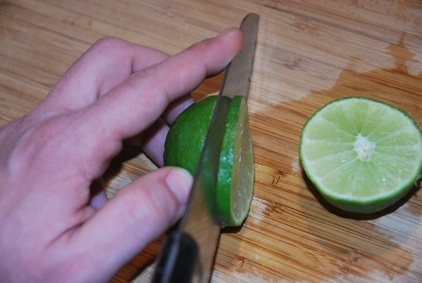 Take a lime and slice it in half. 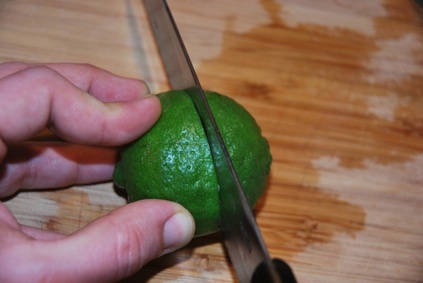 Squeeze the remaining half to the concoction. 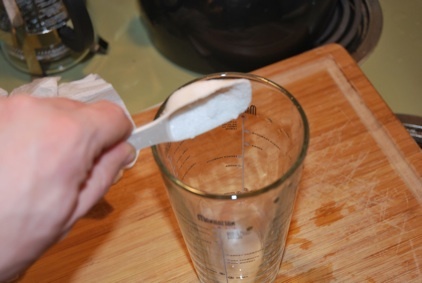 Add a little of the club soda just to loosen up the sugar. Add ice. 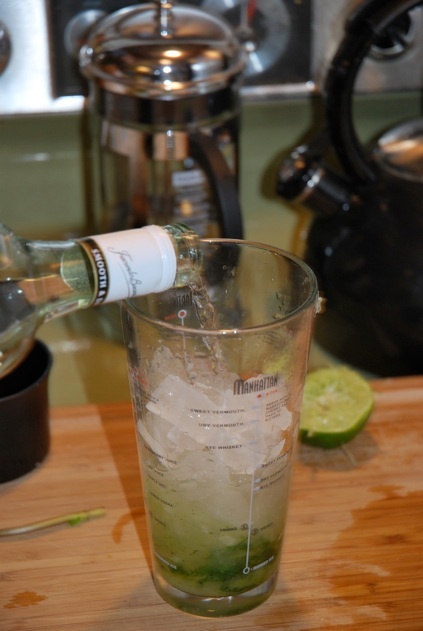 For my glasses, the standard collins glass I add 1 an 1/2 cup of ice. Follow it with the rum. 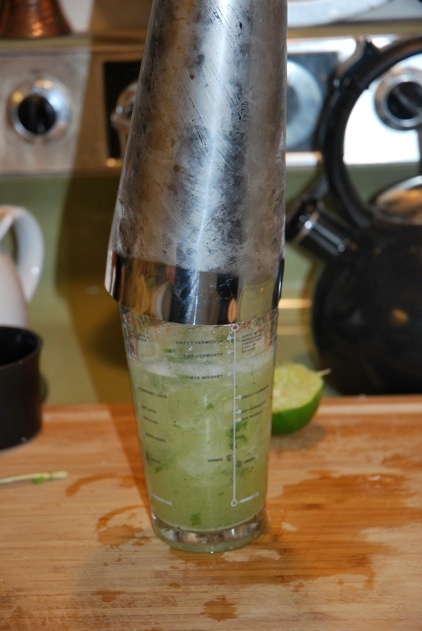 Cover up the shaker with the top part of the Boston shaker and ske vigorously to blend. 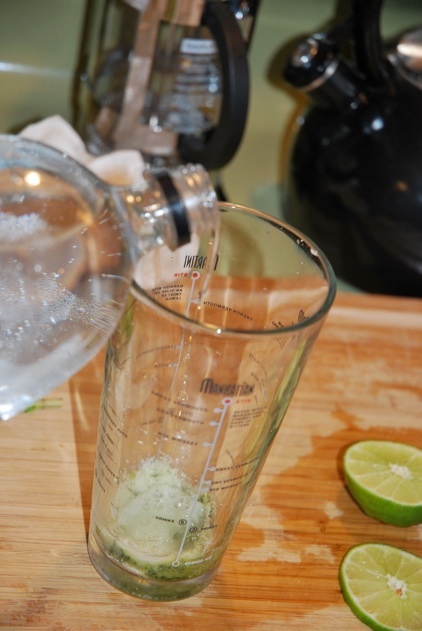 If all worked well, then you will have a great greenish drink. Pour it in your glass. 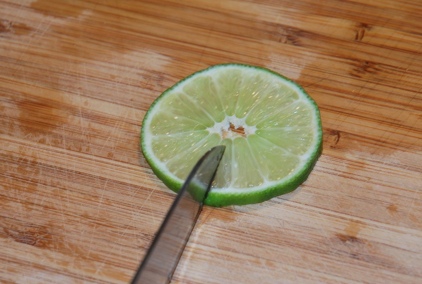 Now go back to the slice we had and cut it, but do not cut all the way to the middle. Leave the little membrane surrounding the segment, in tact to have something to hold on. 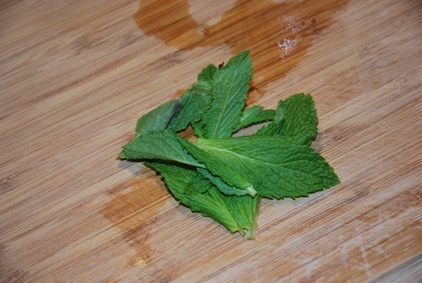 Garnish with one or two mint leaves. And there the Mint julep and Daquiri child. A refreshing original drink that is Cuba in a glass. What if you have never been there? Have a sip, close your eyes and have a trip of a life time. 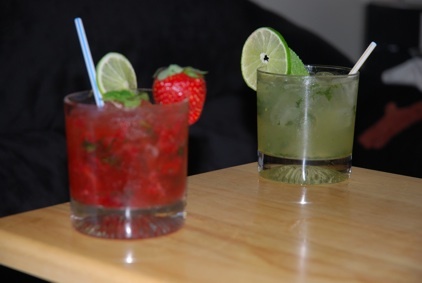 Although I do not like the slushy sloppy overly fruity things the Mojito can be great with strawberries. 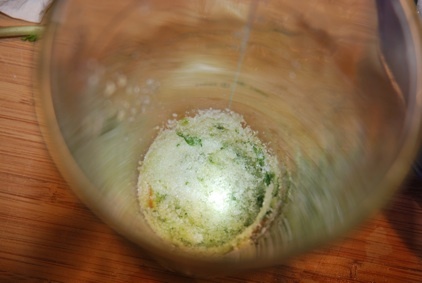 Just add them in the mix after mushing the mint and puree them. Three strawberries cut in pieces will be enough. 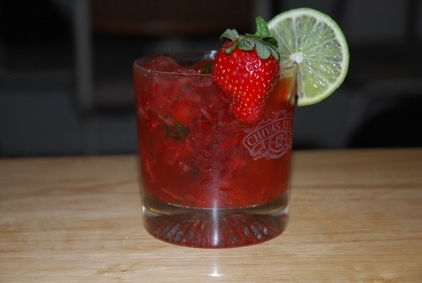 And here is the strawberry Mojito! 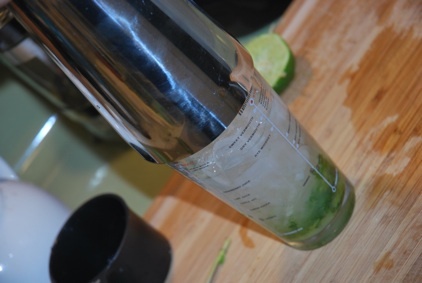 Mojito Family… Yeah the straw is not needed, but helps with the garnish.